Baidu Antivirus is a free antivirus software launched by the very popular Chinese search engine that bears the same name. You get not only one, but three different antivirus engines with this free AV. Two of them are Baidu’s own engines. There’s the standard Baidu Antivirus Engine and another one based on cloud technology called Baidu Cloud Security Engine. On top of those two you also get Avira Antivirus Engine and all of the components of a modern antivirus software, real-time protection, cloud scanners, proactive defense and so on. Similar software: BitDefender Free, AVG Free, Kingsoft AV. Despite of the fact that is has three antivirus engines, Baidu Antivirus is very lightweight, which can also be concluded from the very simple interface that it has. Installer is around 10MB, which is nothing when compared to popular antivirus solutions like Avast 8 which are above 100 MB in download. Simplified interface is gonna greet you with three buttons for starting three different types of scans. Options can be accessed from the menu in the top right corner, and down below you can find information about update and cloud connection status. When you click on the arrow which can be seen on the right from the Custom Scan button, more detailed report about various different components will show up. 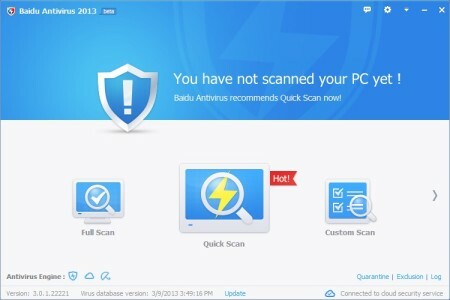 It’s recommended that you start with a Quick Scan first, so that this free antivirus software knows where it stands. Simply click on the Quick Scan button and leave it to do its thing. Scan might take a while, it depends on the size of your hard drives. As you can see pretty much everything is covered, but not in great details. For something more serious and concise you’re gonna have to start the Full system scan. 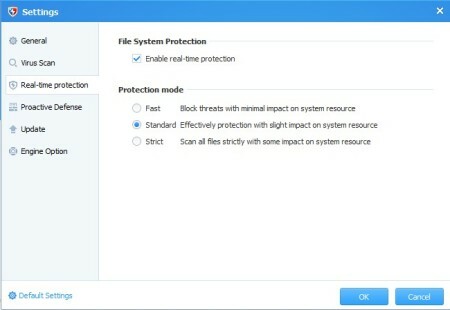 Various different real-time protections can be customized or even turned off by opening up settings using the gears icon from the top right corner of the main interface. Cloud will work right away without any kind of special activation on your part. When you scan individual files, they’re gonna be tested with the very latest virus signatures from the cloud. 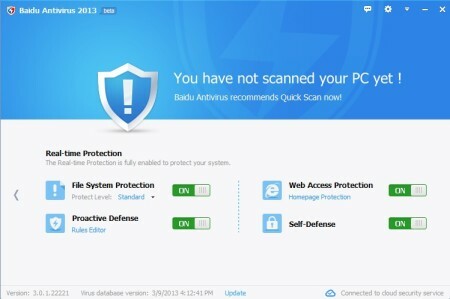 Baidu Antivirus is definitely one of the more interesting AV applications that we’ve reviewed. Detection rate is decent, scans are fast and all that wrapped in a lightweight packaging. However, we haven’t done any professional testing of this antivirus software to test how effective it is against viruses. The fact that it has three different antivirus engines, include the every popular Avira, makes us think this one should be good. Still, we will wait for specialized antivirus software testing companies out there before we recommend this free antivirus. Meanwhile, we’ll stick with our favorite – Avast.